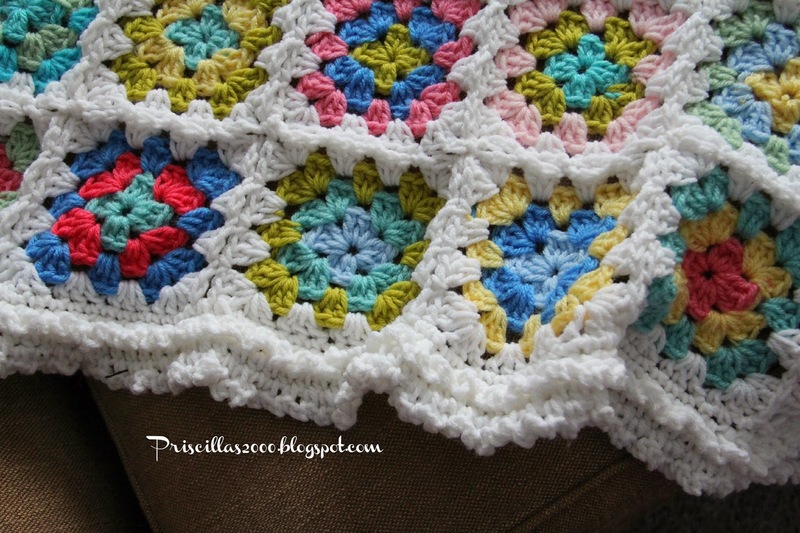 Priscillas: Granny Square Blanket Finished ! Good Morning ! Hope you are having a nice weekend ! 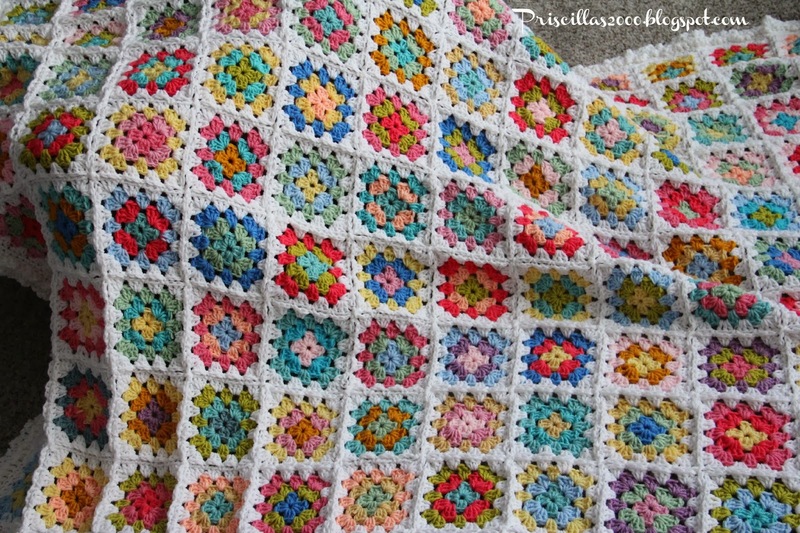 I finished up the granny square blanket I was working on , using up my scraps. I did the join as you go method to connect the squares , so it went really fast. There's 180 squares .. I used mostly red heart acrylic yarn.. I had trouble deciding on a border , I didn't want scallops or the big ruffle I've been using and ripped out several before just trying something and loving it ! I think this is my favorite border ever ! I did a row of single crochet around the whole blanket , then 2 rows of half double crochet. I attached the yarn to the first row of half double crochet and did a single crochet around the post , chain 3 all the way around. This makes little tailored ruffles. Then for the second ruffle row I did sc , chain 3 in each stitch around the 2nd row of Half double crochet. 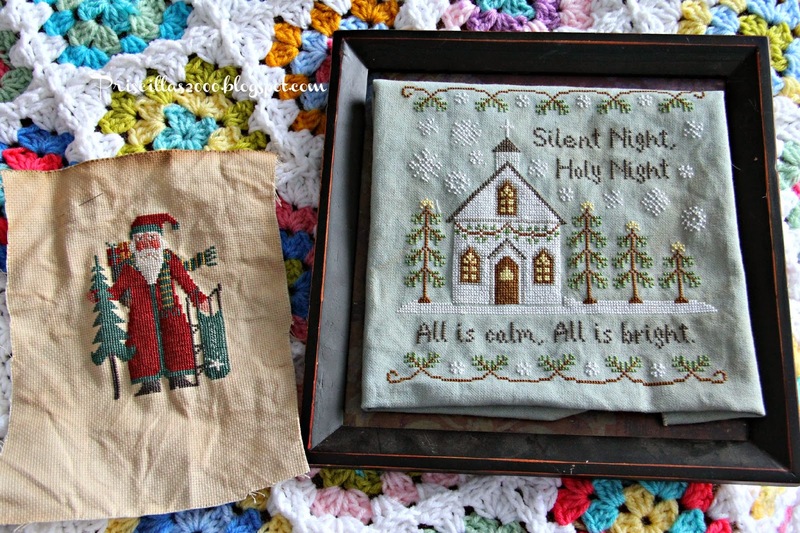 I finished 2 cross stitch pieces...silent night from Country Cottage Needleworks, and another Prairie Schooler Santa for my Santa tree. 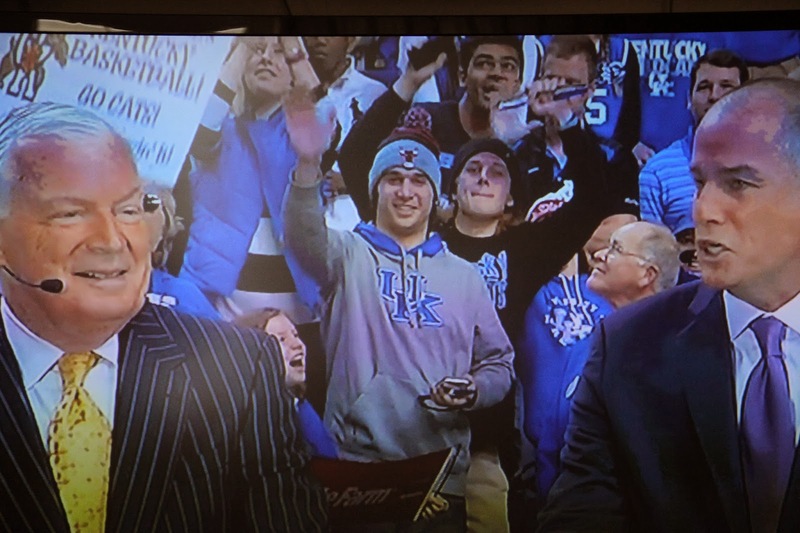 Yesterday my son who is at the University of Kentucky texted and said to watch for him on ESPN college game day show .. So we turned it on and I thought how are we ever going to find him in a sea of thousands of people .. there he is even waving to us :) He's in the grey and that's his dorm mate from last year behind him.. Too funny ! They were all over the TV! Its nice to be able to see him when hes so far away ! 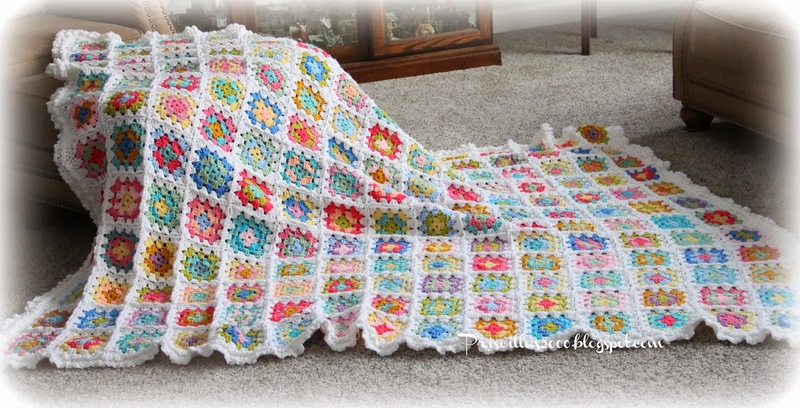 Beautiful Blanket. The springly colors make me smile. Another beautiful Ta Daaa for you Priscilla!!! I love the border!! I saw your IG's and had to laugh. He is so funny. He had the perfect spot to be seen, didn't he?! Hi and wow, how beautiful the blanket is! You did a great job putting it all together and I love the border! I love the cross stitching you did too! Have a nice Sunday and I love the photo of your son and his roommate on TV! Lol. Well this just brightened my day. You are so "busy" - I don't know how you get it all done, but it's encouraging somehow. Beautiful job. Thx for sharing your crafts and your family with us. It's beautiful, so much work! The colours are gorgeous, and i love the frilly edge. 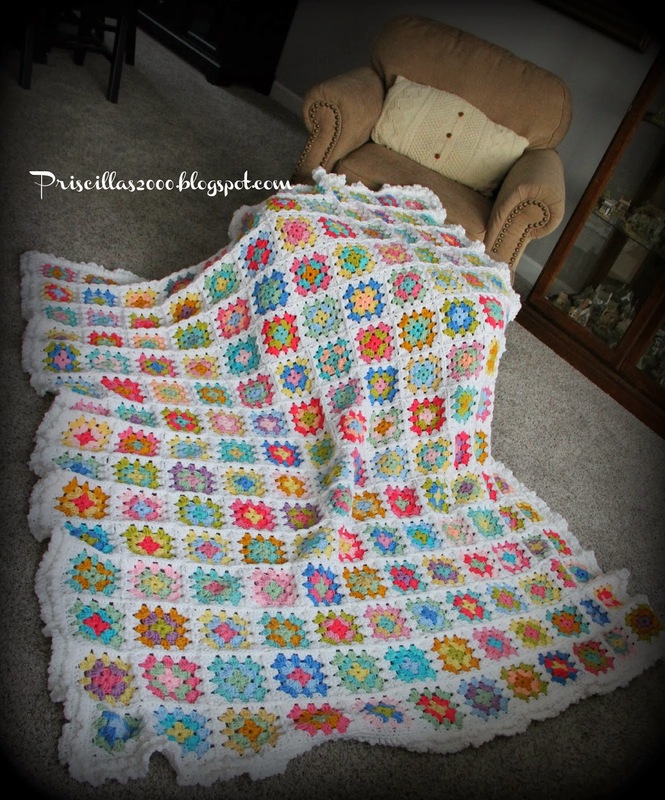 Your granny square blanket is just beautiful and I love the edging! You are definitely one busy girl - I'm in awe of how much you get accomplished. How much fun was it to see your son on TV? Looks like they are having a great time!! Beautiful and I bet it so nice and cozy to take a nap with. Love all the spring colors. 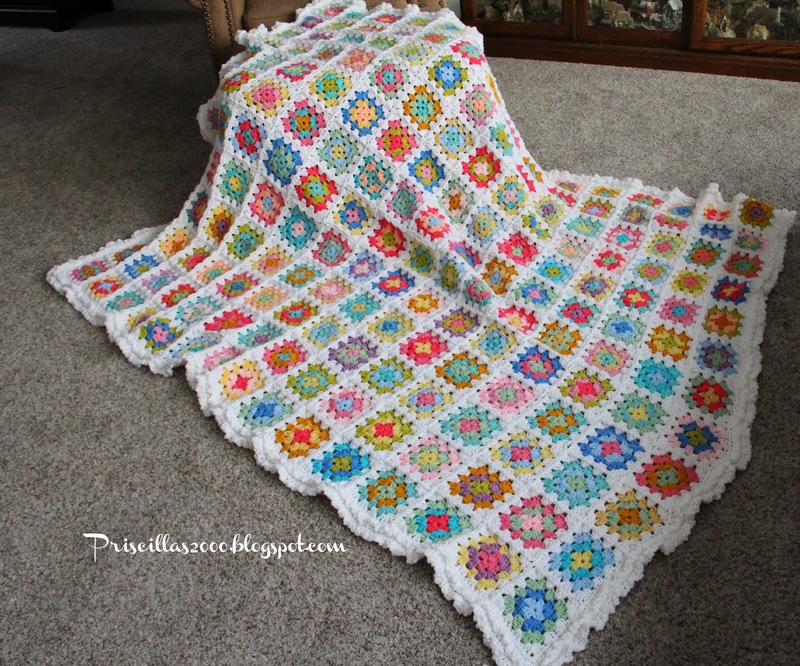 Love your colorful blanket, and finished cross stitch to boot! Great finishes. Great blanket, and lovely finishes in stitching. What a fun picture of your son at UK. 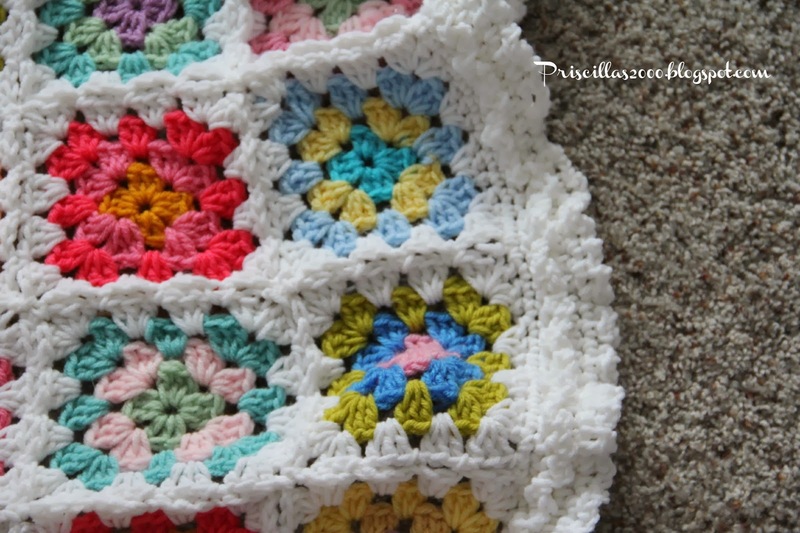 Your blanket is gorgeous, such pretty colours, I've tried and failed many times with crochet, think I'll just stick to cross stitching lol!!!!! Silent Night and the PS santa look great. And what fun to see your son on the TV, he certainly was in the right place. Wow, this blanket is wonderful. I love the colors. Awesome! Great work!! Beautiful! Visiting from My Merry Messy Life. Wow, what a lovely job you did with this afgan. I envy your ability to crochet like that. It is truly beautiful. I'm visiting from Mrs Olsons Linky Party and I'm now following you via, FB, Bloglovin, GFC and G+. So beautifully made! Love those colors. Priscilla, I love the colors you used in this one! 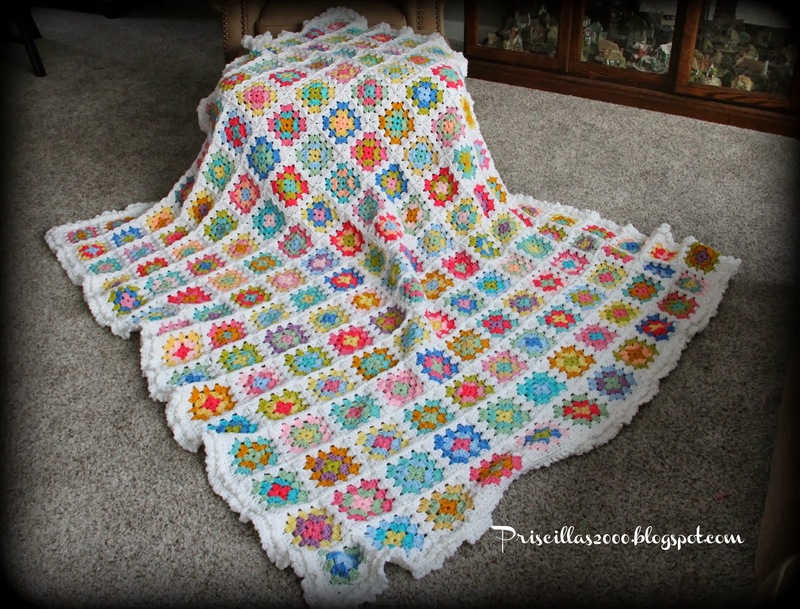 You truly have a gift for crocheting, among many other things! Love that you got to see your son wave. Thanks for sharing with SYC. This is definitely on my to-do list. I just have to keep practicing and get my technique down. Yours is absolutely beautiful and I adore the edging!